The performance of oils and greases for critical mechanical systems often depends on the water content of the lubricant. However, Karl Fischer titration in oil is difficult due to suspended solids, additives and poor solubility in the reagents. 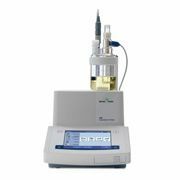 Thus, combined techniques allow for water content determination in oils, at lower temperatures and in shorter time, with the accuracy of KF titration. Long before the ascent of Karl Fischer titration, today’s water determination method of choice, Edward Dean and David Stark developed a method using azeotropic distillation with toluene, utilizing the fact that toluene is immiscible with water and has a lower density and a higher boiling point than water, also. Although not as accurate as Karl Fischer, the heated toluene allowed for low heat separation and expelling of the water from the oil. Many lubricants contain additives making them unsuitable for direct analysis in a Karl Fischer titrator due to side reactions. Used engine oils can be directly analyzed, but require frequent changing of reagents and chemicals, wasting time and money. Drying ovens in conjunction with a Karl Fischer titrator offer a solution, but require high temperatures, may require long time and can experience tube blockages due to evaporation of other volatiles, which may ultimately cause system failure. Using a METTLER TOLEDO’s C30 coulometric Karl Fischer titrator and Stromboli drying oven with the addition of toluene to the sample vial allows combination of the advantages of the Dean-Stark method with those of Karl Fischer titration. Now, water can be determined at lower temperatures and in a shorter time, but with the higher accuracy of Karl Fischer titration. By a simple addition of toluene, difficult, cumbersome and problem prone water determination of lubricants and oils can be tremendously improved. The Dean-Stark Karl Fischer Analysis is fast becoming the method of choice for oil and lubricant companies yielding fast, accurate, low maintenance and automated water determination.